See below for actions you can take to help US war resister Kimberly Rivera. We had an amazing community meeting in the Parkdale neighbourhood of Toronto last night. More than 200 people crowded into the Parkdale United Church basement to show their support for their friend and neighbour Kim Rivera, and to voice their disgust at the Harper Government for its callous, wrongheaded decision that Kim and her family leave Canada. 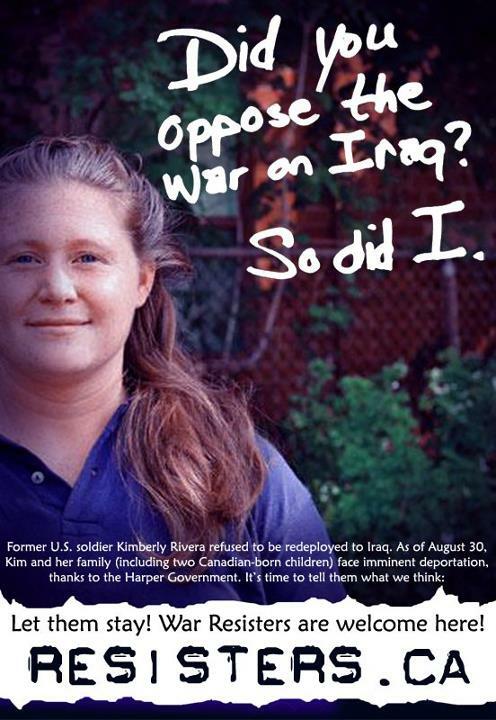 Rivera - an Iraq War veteran who refused a second deployment and came to Canada with her family in 2007 - has been told she must leave Canada and return to the US by September 20. If she is turned over to the US military, Rivera will likely face a lengthy jail sentence. She will also have a felony conviction that will remain on her record and restrict her opportunities on her record for the rest of her life. Some of the loudest applause of the evening was in response to a letter from the Most Reverend Desmond Tutu, urging Minister of Citizenship and Immigration Jason Kenney to lift the deportation order and allow war resisters to remain in Canada. Parkdale MP Peggy Nash was on retreat with the NDP caucus, but a representative from her office spoke in strong support of Kim. Nash has been a long-time supporter of the war resisters for many years. City Councillor Gord Perks spoke eloquently, saying that instead of deporting peaceful people of conscience like Kim, Canada should be recruiting them. MPP Cheri DiNovo also spoke, noting that her late husband was a Vietnam war resister, and reminding the crowd of the positive impact made on Canadian society by the tens of thousands of men and women who came to Canada in the late 60s and early 70s. A letter from Amnesty International, outlining the legal reasons why Kim should be allowed to stay in Canada as a conscientious objector, was also read. The letter noted exactly how Kenney and Prime Minister Stephen Harper are in violation of international laws and treaties in their continued persecution of Iraq War resisters. Representatives from the Canadian Council of Churches and the Quakers also spoke. The final words of the evening belonged to Kimberly Rivera, who thanked us all for our energy and enthusiasm, and said she will fight with Parkdale to stay in Canada. When the brief speeches were done, everyone signed letters to Kenney, and there was a candlelight procession through the Parkdale neighbourhood. The energy was incredible. While Kim and her lawyer pursue all legal avenues to challenge the deportation order, we must take to the streets, to the phones, and to our keyboards, to show that Canadians say: WAR RESISTERS ARE WELCOME HERE. Here are several actions you can take in your own community to support the Riveras. We have only two weeks. We need you to organize in your own community to amplify this message in towns and cities from coast to coast to coast. Organize local pickets, petitioning, and leafletting! See our website for materials to help get you started. Fill in your own information and hit the streets! Organize a similar demonstration at the same time! You don't need a lot of people. This is the day before the Riveras' removal date. We must raise our collective voice to loudly say: LET THEM STAY. Call Jason Kenney, Minister of Citizenship and Immigration. Tell him you support war resister Kim Rivera and you want the government to allow her to stay in Canada. A suggested script for this phone call will be on our website: How you can support the Rivera family. This takes only a few minutes. Call every day! If you haven't done so already, sign a letter to Jason Kenney and your MP. The letter is here: Letter to Jason Kenney. Letters to the editor are an effective way to get our message out. Letters to the editor in support of Kim are already popping up in major newspapers. Keep the letter short and simple, and you can reach thousands of people. THANK YOU to every supporter who has so generously given funds so we can mount this public campaign. If you can, please donate either online or by cheque. To donate online, go to our ChipIn page. THANK YOU FOR ALL YOUR SUPPORT. We have only two weeks to make this campaign as visible and as loud as possible. Kim Rivera risked so much for peace. Now it's our turn to fight for her and her family. LET THEM STAY!